In her second blog post from Colombia, Rogelio Salmona Fellow, Freya Cobbin reports on her travels away from the capital, Bogota, and continues to explore the relationship between Salmona's buildings and those who use them today. The next two weeks have been very contrasted to the initial ones. More travelling on the go, moving at a faster pace through the verdant coffee plantation landscape of the Zona Cafetera. 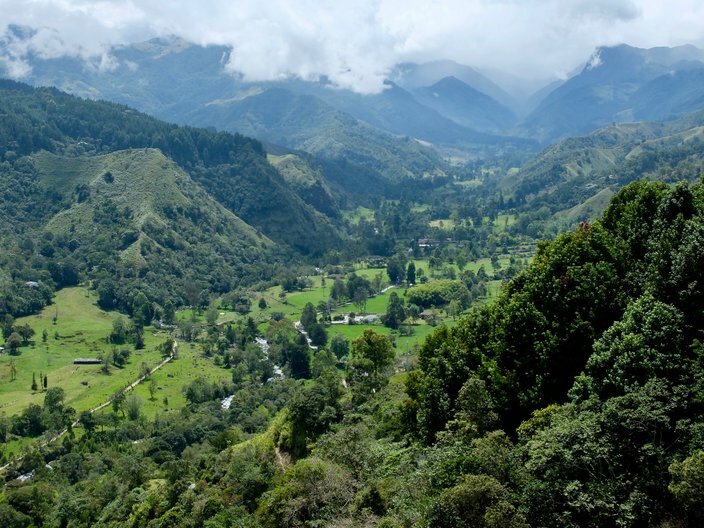 A quick visit to Armenia, Salento, Pereira and Manizales on the way to Medellín makes the time spent in Bogota look very sedentary in comparison. The testimonies during these visits were of a different variety. They spoke about whole communities and society at wide. And the buildings I visited were of an institutional scale and typology to match. I learnt a lot about agency and collective ownership, or lack thereof; and the importance of democratic participation in securing the success of a community institution for the future. Part 1 of this venture enabled me the opportunity to reflect on the past in Armenia, and glimpse the future potential in Manizales. The Quimbaya people were one of the most important pre-Columbian civilisations to inhabit the central Andean region. They have suffered centuries of discrimination and brutal oppression since the colonial era. After much tension had arisen from many indigenous communities across the country to gain their due recognition and rights in the 1980s, the Banco de la Republica decided that they needed to be honoured and commissioned Rogelio Salmona directly to construct a museum in Armenia dedicated to their culture. There are other political motives which also shaped this tactical decision. The building was constructed rapidly but with precision. The architecture employs all of Salmona’s great elements; courtyards, gardens, galleries, framed window views and the infamous inhabitable roof terraces that provide vistas to the curated landscape beyond. The building was awarded the highest accolade of Colombian architecture (Premio Nacional de Arquitectura) in 1988. The Quimbaya themselves were not consulted during the design process, nor for the curation of the exhibits it contains. An enthusiastic team deployed by the Banco was in charge of directing the programmes and curating the collection when it opened which earned a successful public reception in its early years. However as the team gradually retired or moved on to other things, and the Banco lost ongoing interest in its management, the museum began to reflect its lack of collective ownership. Today, at 30 years old the building is in need of some love. Although the double wall construction did well to survive the earthquake which shook Armenia in 1999, the roof deck is currently inaccessible to the public and needs repair. Moreover in spite of the national heritage that has been awarded to the building; walls have been pulled down and refashioned without permission. 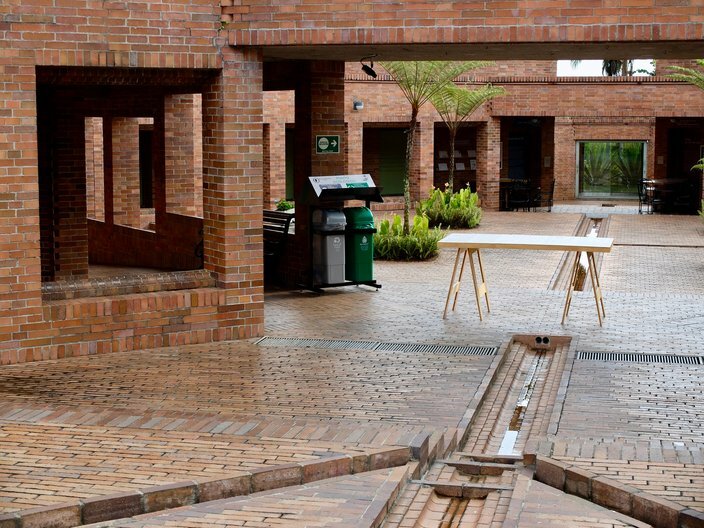 Even the temporary items that adorn the spaces such as display tables, bins and signage do not pay much respect to the architectural geometry - objects blocking the key axis of the cascading courtyards suggest a laziness in the current organisation. Whilst ample space was provided for community rooms and event hosting spaces they are poorly used in reality. The vision to embed the building within the topographic hills to the north of the city, and make-subtle the entrance by adorning the frontage with a rich layer of palms was a romantic concept; but the reality has proven - away from the town centre, without the footfall of a larger city, there is not the chance encounter for passers-by to find it. It has remained too under-discovered. Free to the public, the museum is the first of its kind in the region, however for the investment, one might question what is the true return. The collection on display is poor, and although animated guided tours are also available at no cost to visitors, there is very limited information about the contemporary Quimbaya who still continue with certain traditions today, somewhat displaced. If, in theory, they are the first community to be honoured by this project, the remodelling of the building that keeps being promised and certainly the content of the exhibitions might need to consider the lacking aspect of their real input. To drop a museum in a place that has little or no precedent of such an institution is difficult. One needs to learn how to accept and eventually adopt the spaces in order to take pride over the building and use to one’s advantage. The lesson is that one cannot expect to gift such a facility to any community and expect their immediate uptake and ongoing maintenance and compassion without incentives to adopt it for themselves. What struck me most was that actually the museum here could have targeted two potential communities - that of the Quimbaya, and also the local population of Armenia and its environs. However it seems that it was pitched in between the two, loosing out on true agency from either. This is not unreclaimable in the future but the ongoing management and PR teams have their work cut out for them, to prove this was not a tokenistic endeavour. 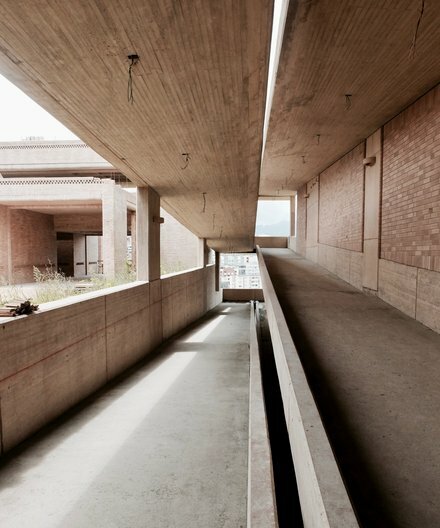 As Rogelio Salmona’s most recent project - so new that is is still under construction, the first phase of the Centro Cultural at the Universidad de Caldas is quite a unique project for many reasons. As one of the last projects with which Salmona was engaged the challenge to the team who are delivering it is impressive and they have succeeded with many difficulties, including the necessary additions required to meet the seismic regulations which were not present for his many Bogota schemes. Being able to see one of the famed architect’s projects, posthumously in progress is a unique and wonderful experience. The state of the unfinished work allows one to image the glass both half full or half empty. A great work on its way to delivery full of potential to be capitalised; or one left abandoned to ruin, reminiscent of the ancient structures that so inspired Rogelio on his travels throughout Latin America and Europe. The scale is overwhelming, certainly the largest of all Rogelio’s work. Many former architectural elements are echoed here but on a multiplied scale. A gigantic circular aperture creating the main atrium space is reminiscent of the Virgilio Barco Library, and the framed vistas at the end of roof terraces and ramped circulation feel familiar albeit their new context. The construction process reveals the carefully designed moments - the layered brick corbelling, complex formwork to achieve diamond ceiling joints and stacked pre-cast staircase details. But this is a truly 21st century project which considers its digital-age end-users. Provisions for services, particularly to host new technology has been designed within the scheme. This is the first facility of its kind in Manizales and is highly anticipated. The design in progress is the first phase of a reduced version of the original scheme, however with a determination from the university to realise the project, elements were modified to make it feasible. When complete, although a part of the university - the library and auditoria will open to the public, hosting a range of cultural events. Moreover it will be a destination in its own right and will put the whole region on the map. 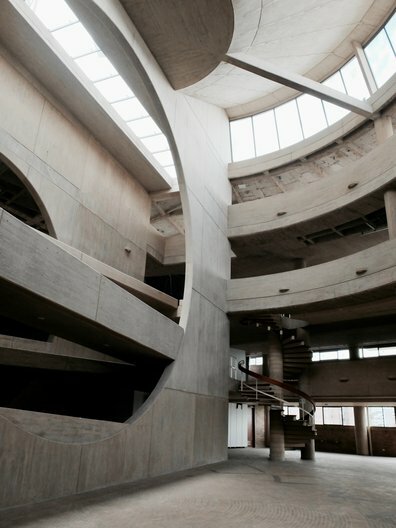 With the reception that the Centro Cultural has already received one hopes that the mistake suffered in Armenia will not be made here, and that it will continue to be a cherished facility for generations to come; by the internal management, university students and staff, wider local/national community and visitors alike. To find out more about the exciting residencies, fellowships and travel grants we offer head to our Opportunities page and follow us on Instagram and Twitter.